Today, the sixth day of Kwanzaa’s Principles is Kuumba (creativity): Using creativity and imagination to make your communities better than what you inherited. Symbol: Muhindi (moo-HEEN-dee) represents the children (and future) of the family. One suke (ear) of corn is placed on the Mkeka for each child in the family. If there are no children in the family one suke is still placed on the Mkeka to symbolize the children of the community. The Muhindi also represents the Native Americans who were the first inhabitants of the land. Without whom there would be no corn, also known as Maize. It is used as acknowledgment and respect of their contribution to the culture and ancestors of the African American. A single ear of corn can also be know as Vibunzi. Indian Corn is sometimes used. 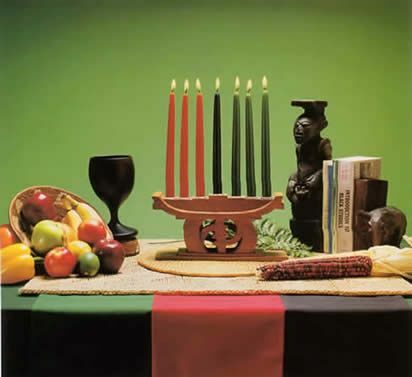 Note: There are 7 Symbols of Kwanzaa. I have included them in no specific order. This year, Kuumba inspires Me to give up boredom and all things that block (and people who drain) My Creative Processes and Enjoyments. Boredom is a sign that you are out of alignment with your purpose (see Kwanzaa 2013: Nia, Purpose). Boredom is a result of stress, frustration, FEAR, avoiding personal issues, complacency, giving your power away, and a variety of other activities that you can control and improve in your life. Ergo, boredom is a barometer for how well you are living. You can also look at boredom as an indication of how well the CHOICES you make are working for you. It is said that only boring people get bored. So, when you get bored, you are clearly not taking the proper care of your mind-body-spirit to keep yourself stimulated to enjoy the creative process. You need to make changes to your routine, your thoughts, and your actions. Change begins with intention followed by inspired action. When you are inspired, you are never bored. I have given a variety of tools in previous posts in this series and elsewhere on My Ask Mss Didi* resource blog. Below are other resources to assist you in keeping your focus on Self-Love-and-Empowerment to BEing your Best and being thrilled by the process! This entry was posted in Domina101™, Etiquette, Events, Philosophy/Lifehack, Self-Love & Care, Technique and tagged advice, BetterFetish™, ClassicFetish™, DommeSalon™, etiquette, howto, lifehacks, Mistress Didi, partydomme, respect, social, The Fetish League™ on December 31, 2013 by MssDidi.